How much are other NATO members free-riding off US military spending? In view of Russia's recent military activities, it has been suggested that NATO members increase their military spending so as to create a stronger deterrent. According to the Stockholm International Peace Research Institute, NATO members spent $990 billion on the military in 2012. However, the percent of GDP spent on the military varies considerably across countries. Among the ten biggest spenders in NATO (on absolute terms), the United States spends by far the most at 4.4% of GDP, while Spain spends the least at only 0.9% of GDP. 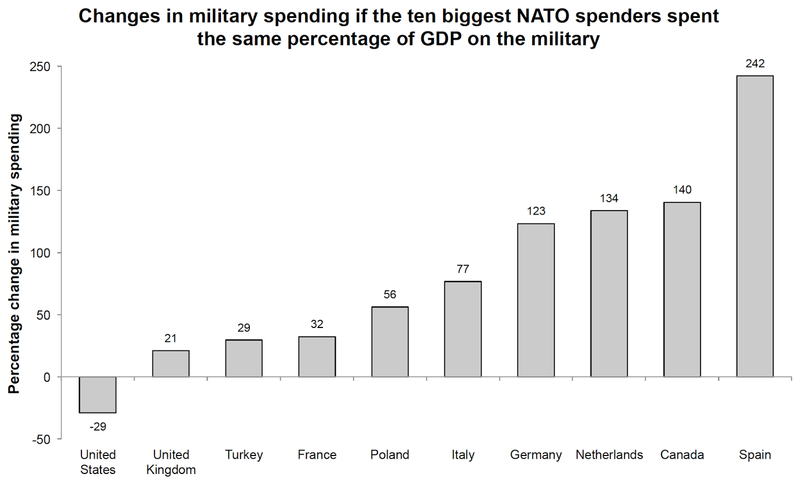 This has led some commentators to argue that other NATO countries are free-riding off US military spending. Does an infinite supply of money throw out the case for austerity? Last week, in its Quarterly Bulletin, the Bank of England published a nice article explaining the process of money creation in a modern economy. David Graeber, writing in the Guardian, read the main headlines, ignored most of the details, and then proceeded to make the bizarre claim that this revelation “throws the theoretical basis for austerity out the window”. To be fair to Graeber, it is not entirely clear what he is trying to say in his piece. There are so many non sequiturs and overlapping claims that it is difficult to isolate the actual message. I will try to interpret the piece as charitably as I can, and respond to each of the possible interpretations in turn. Interpretation 1: Banks can create unlimited (broad) money. Hence there is infinite money to fund government spending. Austerity is therefore meaningless and/or unnecessary. It's this [false commonplace] understanding that allows us to continue to talk about money as if it were a limited resource like bauxite or petroleum, to say "there's just not enough money" to fund social programmes, to speak of the immorality of government debt or of public spending "crowding out" the private sector. What the Bank of England admitted this week is that none of this is really true. It is true that there are no fundamental limits on the creation of broad money. As long as the banking sector as a whole is willing to issue loans to borrowers, it can create an unlimited quantity of credit. The problem is that for any unit of credit created, there is a corresponding unit of debt. This means that none of the bank, the individual borrower, or the economy, is wealthier as a whole in the sense that it can command a greater quantity of goods and services. The banking sector expands its loan book (its claims on the economy), but this is funded simply by increasing the quantity of deposits (the claims of the economy on the banking sector). There is no net gain, unfortunately. The individual borrower has gained a line of credit, but this is funded merely by issuing the bank claims on his or her assets/future income. Money (both broad and narrow) is just like any other debt instrument. It allows us to bring forward consumption from the future to the present (for borrowers) and to defer consumption (for savers). The more credit creation by the banking sector, the more this intertemporal substitution of consumption is occurring. It allows us to consume more today, but this is merely at the expense of consumption we would otherwise enjoy tomorrow (government consumption today comes at the expense of taxation in the future). Credit creation does not expand the intertemporal consumption set. And shifting spending from the future to the present, without expanding the current supply of goods and services is likely to simply lower the value of credit relative to these items—that is, cause inflation (more on this below). Of course, governments may wish to deliberately shift the burden of deficits onto future generations. Routine demand management through monetary/fiscal policy may aim to deliberately bring about inflation and lower interest rates to shift consumption forward. And of course the presence of macroeconomic growth changes the picture entirely. But these are not the same thing as saying that there is infinite money and hence there can be infinite spending. Where Graeber has gone wrong is to think of money merely as a means of exchange, and hence wealth, rather than as an IOU (this despite his headline): the thinking being that since “money is used to pay for stuff”, and “there is infinite money”, the government must be able to buy an infinite amount of goods and services. But money is also credit (and hence debt) and so the “more stuff” you consume now (assuming there is no inflation) is offset by the “less stuff” you will able to consume in the future. Strangely enough, the reason why money is misunderstood is probably because we are so familiar with it as a means of exchange that when we hear that banks can issue an infinite supply of it, we infer that there are infinite possibilities for consumption. But if someone claimed "General Electric can achieve infinite possibilities for consumption because it can issue an infinite supply of GE commercial paper" we would immediately recoil. We would (correctly) point out that this process is constrained because supplying more and more GE debt would lower the value of these claims with respect to the rest of the economy since investors would demand a higher return (GE "money" would experience inflation), and GE would still have to repay the paper it had issued. Intepretation 2: There is infinite money, so we do not need to worry about “crowding out”. This is again what I read from the two paragraphs quoted above. I think what Graeber is saying is this: government deficits do not cause crowding out because the banking sector can always create new loans/deposits to fund private sector investment. At the risk of belaboring the point, I will just make a couple of quick responses. First, once again, a greater volume of credit increases the claims of the economy on consumption and capital goods without doing anything to increase the current supply of these goods. A fall in the relative value of these claims (or equivalently, a rise in the price level) is likely to occur. This means that the real stock of investment is scarce. Second, while theoretically there are no limits to bank credit creation, there are of course practical considerations that serve as effective constraints. For instance, when banks create credit, they perform a maturity transformation, creating very short-term liabilities (deposits) in order to fund long-term assets (loans). This introduces liquidity risk (and capital quality risk if the loan turns bad) and so, for a given level of central bank reserves in circulation, credit creation is constrained. Interpretation 3: Austerity is unnecessary because the central bank can monetise government debt. A disclaimer: Graeber’s piece actually doesn’t make this claim, which is unfortunate because it happens to be the most plausible argument for the idea that deficits don’t matter due to the nature of fiat money. There have been some serious suggestions that the ECB attempt to do this. The problem with the argument, of course, is that it doesn't actually reduce the size of government debt. All it does is swap one type of government liability (bills, notes and bonds) for another (central bank money), and all government liabilities have to be paid for by the private sector via taxation—either explicit taxes levied on income/consumption in the case of bonds, or inflation in the case of central bank liabilities. Wyplosz (link above), while making the case for monetisation, also notes the exit problem associated with inflation. Of course, the vast asset purchase programmes by the Fed, BoE and BoJ have not led to rampant runaway inflation. There are two simple reasons for this. First, all things being equal, the world is in a very deflationary state. Second, and more importantly, the Fed, BoE, and BoJ have not been monetising government debt. In fact, policymakers are at pains to point out that they are doing nothing more than routine open market operations. A related question I sometimes hear--which bears also on the relationship between monetary and fiscal policy, is this: By buying securities, are you "monetizing the debt"--printing money for the government to use--and will that inevitably lead to higher inflation? No, that's not what is happening, and that will not happen. Monetizing the debt means using money creation as a permanent source of financing for government spending. In contrast, we are acquiring Treasury securities on the open market and only on a temporary basis, with the goal of supporting the economic recovery through lower interest rates. At the appropriate time, the Federal Reserve will gradually sell these securities or let them mature, as needed, to return its balance sheet to a more normal size. If by any chance such massive purchase of the JGBs is interpreted, apart from the necessity in monetary policy conduct, as aiming at fiscal monetization, confidence in the Bank could be eroded considerably and long-term interest rates could rise substantially. That will affect significantly the government which issues the JGBs and financial institutions which hold the JGBs, thereby could impair the stability of the financial system and the real economy. In order to avoid such things, the Bank considers it important to firmly convey the idea to the market that the Bank will not carry out fiscal monetization. In addition, so that the market can always check the Bank's actions, the Bank will continue to disclose the state of purchases under the Program in a transparent manner. In short, central banks have made it clear that these programmes (QE) are temporary demand management policies rather than permanent deficit financing tools. Markets therefore do not expect the vast expansion of base money to be permanent and so expectations of inflation remain incredibly low. Given the highly deflationary shocks we're facing, it's not clear whether limited but permanent monetisation would lead to high inflation. Nevertheless, it remains incorrect to claim that all deficits can be monetised without ill consequence. Should the government compensate people who are mistreated by the police? A couple of months ago, it was reported that two students who were wrongfully arrested and then strip-searched by police officers in London would each be compensated £20,000 by Scotland Yard. This seems perfectly reasonable, until one realises that the £40,000 they were awarded did not come out of nowhere, but was in fact tax-payers' money. Several police officers mistreated two individuals, and as a result £40,000 was transferred from people who had nothing to do with the incident to the two mistreated individuals. One might claim that compensating the two students was an appropriate use of tax-payers' money. But there are a couple of things to consider. First, the £40,000 that was transferred is money that can no longer be spent on public goods such as preventing crime, maintaining roads and improving education. Second, both students are reportedly studying for PhDs, one in law, so are likely to earn substantially more than the median income during their lives. Depending on exactly how much they go on to earn, the transfer in question may well have been a regressive one. In my opinion, the case for allowing people to take the police to court and sue them for damages is extremely weak. Arguably, it should not be possible to sue the police, the government, or any other organisation funded by the tax-payer. In the present case, it would have been preferable for each student to sue the specific police officers who mistreated him. That way, fewer resources would need to have been spent punishing the police officers for a given level of deterrence (because the possibility of having to pay with their own money would have deterred them), and zero money would need to have been transferred from tax-payers. Under a system where individual police officers are the ones who get sued, Scotland Yard has less incentive to hire competent police officers, but each police officer has a stronger incentive not to mistreat people. That is, unless Scotland Yard compensates by lowering any additional punishment to such an extent that police officers face the same level of deterrence as before. In a recent article in the Monkey Cage ('The real reason why millennials don't trust others', March 17), Eric Uslaner argues that "social trust rests on a foundation of economic equality", pointing out that "From 1966 to 2010, trust and inequality are strongly linked." His claim is that rising income inequality is one of the reasons why social trust has declined in the United States. However, the latest research contradicts this claim. Fairbrother and Martin (2013, Soc. Sci. Res.) analysed data on both states and counties, and found no relationship between trust and inequality over time. To quote their abstract, "the declining trust of recent decades certainly cannot be attributed to rising inequality." What do wealth distributions tell us about economic inequality? A lot of reports have been making headlines recently trumpeting the irresistibly catchy claim that “X number of individuals have more wealth than the bottom Y% of the population”. The most recent manifestation of this has been this morning’s Oxfam report claiming that “the five richest families in the UK are wealthier than the bottom 20 per cent of the entire population”. Here I want to lay out a simple critique of using “wealth” distributions to make broader claims about economic inequality. Tim Harford and Tim Worstall elaborate on this very persuasively, so I will do no more than draw the broad strokes. The heart of the critique is this: wealth is usually measured as “the marketable value of financial assets plus non-financial assets less debts”. It is this last part of the definition that makes a discussion of “wealth” at best misleading and at worst meaningless. For the class of people with zero measured wealth may span a huge spectrum: it will include the genuinely poor and destitute, but it will also include the hedge fund manager who has taken out a £30 million mortgage on a Kensington townhouse, or the new lawyer earning six figures but with a stack of student debt. Conversely, the category of people who have high measured wealth will of course include those who are genuinely wealthy, but will also include pensioners who have accumulated net savings over their lifetime to consume in their retirement. The studies that make this kind of claim are superficially true. For instance, it is correct to say that six members of the Walton family have more wealth than the bottom 30% of Americans. But, given that close to 1 in 4 Americans have zero or negative net wealth, the point is that so does anyone with a penny in their pocket and zero debt to their name. This is not to say that economic inequality does not exist or that it is not a problem. It’s just that looking at “wealth distributions” of this kind doesn’t tell us anything meaningful about the world. Many people are vegetarians because they believe it is wrong to eat animals. The moral argument for being a vegetarian comes in a variety of flavours. One such flavour is as follows. Humans can live healthily without eating meat; it is wrong to cause unnecessary suffering; eating meat causes unnecessary suffering to animals; therefore, it is wrong to eat meat. Before I get to my main point, I want to take a slight digression vis-a-vis the first premise, namely that humans can live healthily without eating meat. At present, there doesn't seem to be any evidence that, all else being equal, someone eating the healthiest possible vegetarian diet could become healthier by including some amount of meat in her diet. However, suppose there was such evidence. It is not inconceivable that scientists might one day find some. How big would the effect of meat supplementation have to be before the argument in the first paragraph no longer held? It is reasonable to hypothesise that, if there were an effect, it would be described by an inverse-U relationship (see below). For example, suppose that healthiness were measured in QALYs, and Δh* = 3. Would that be sufficiently great to justify eating meat? Now to return to my main point. A non-trivial fraction of people who don't eat meat for moral reasons are not opposed to animal research. One prominent example is the moral philosopher Peter Singer. After all, there are good reasons for thinking that animal research has contributed significantly to advances in medicine over the last century. Incidentally, this is not to say that we couldn't have made advances in medicine without animal research, but just that they would have taken longer, or in a few cases, might not have occurred at all. The typical argument from someone who opposes eating meat but does not oppose animal research is as follows. Humans can live healthily without eating meat; humans cannot live healthily without animal research; therefore, although animal research causes suffering to animals, it is morally justified. Another way of stating this argument is as follows. The benefits of eating meat are small relative to the costs; the benefits of animal research are large relative to the costs; therefore, animal research is morally justified, whereas eating meat is not. Notice that the argument is full-bloodedly utilitarian. The person who opposes eating meat but not animal research is not defending the absolute rights of animals, but is arguing that they should not be harmed unless the benefits to humans are sufficiently great. In other words, he is willing to use animals for his own purposes so long as the benefits to him and other members of his species are large enough. And once it is acknowledged that the argument in the third paragraph is a utilitarian one, establishing its veracity becomes a matter of empirical enquiry. Short of empirical enquiry, a little reasoning suggests the argument may not be correct. The main reason is that healthiness (or QALYs lived) is not the sole criterion by which utilitarian propositions are evaluated. 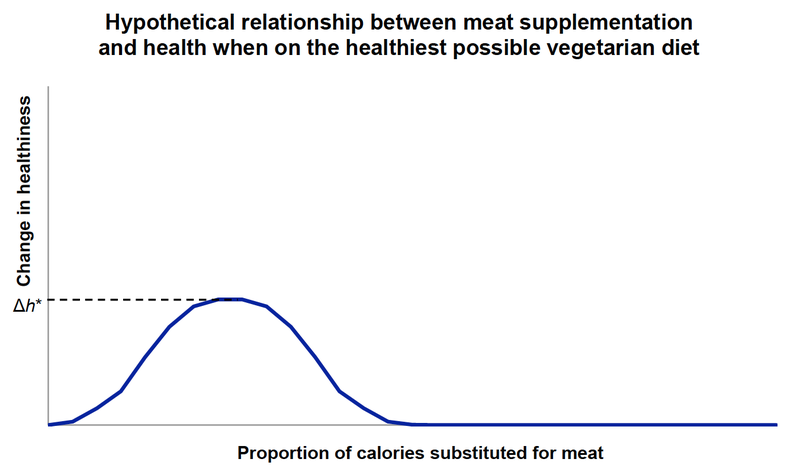 Even if supplementing the healthiest possible vegetarian diet with some amount of meat does not make someone on that diet any healthier, it does not follow that eating meat has zero benefits. Importantly, people seem to get a lot of pleasure from eating meat. It is almost certainly true that some fraction of people would be willing to trade-off some QALYs for the opportunity to eat a small amount of meat. And contrary to some versions of the argument in the third paragraph, there is no obvious reason why wanting to live longer is less selfish than wanting to enjoy the taste of meat. Notice that I am not claiming that eating meat is morally justified. I am simply arguing that it is not obvious that animal research is morally justified, while eating meat is not.